My foster mom says that I have really come out of my shell since I came to live with her. I am not sure what a shell is, but I do know that now I am a happy, gentle and socialized pup. I love other dogs and even like c.a.t.s! I will probably never be hulking in stature because I am a mix of golden retriever and cocker spaniel, but I am large on personality! I make my foster mom laugh when I get the “zoomies” in the backyard and then I grab my fur foster sister, Georgia’s tail or leg to encourage her to join me in the craziness. I love all my toys, especially the squeaky ones and I am content to entertain myself if no one is available to play with me. I enjoy belly rubs so much that I will lay on my back with my legs straight up, hoping someone will notice me and appease my craving with a few scratches. I love walks and with continued practice, I am learning to stroll calmly on my leash. I think that means that I am a “work in progress” in that area! Thunder storms and loud noises don’t bother me and I even slept through most of the July 4th celebration. I’m still not completely sure about getting into the car, but if my foster sibs lead the way, I follow along so I don’t miss out on any fun. I love to snuggle with my humans and because I am not real big, I don’t take up much room on the bed or couch. Sometimes I still need a little time to adjust to new situations. Therefore, it would be nice to have another canine in my furever home who would be my companion and help me continue to learn the finer points of enjoying a dog’s life. Everyone who meets me thinks I am a sweet loving little guy and very handsome too. 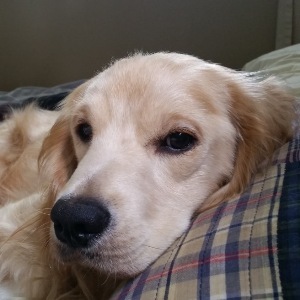 Having a thick wavy golden coat certainly doesn’t hurt the total package either!